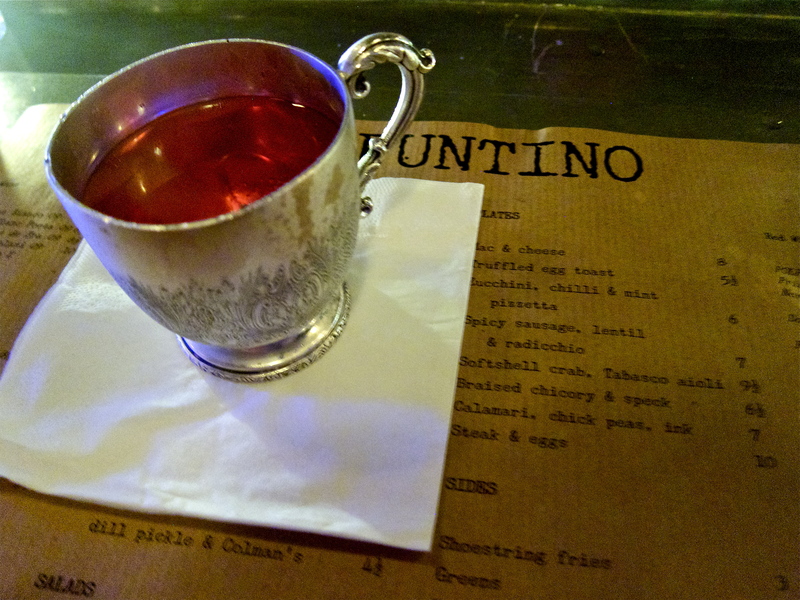 The latest, smallest & funkiest Soho outpost from Russell Norman, Spuntino has a great ambience & is a lot of fun. 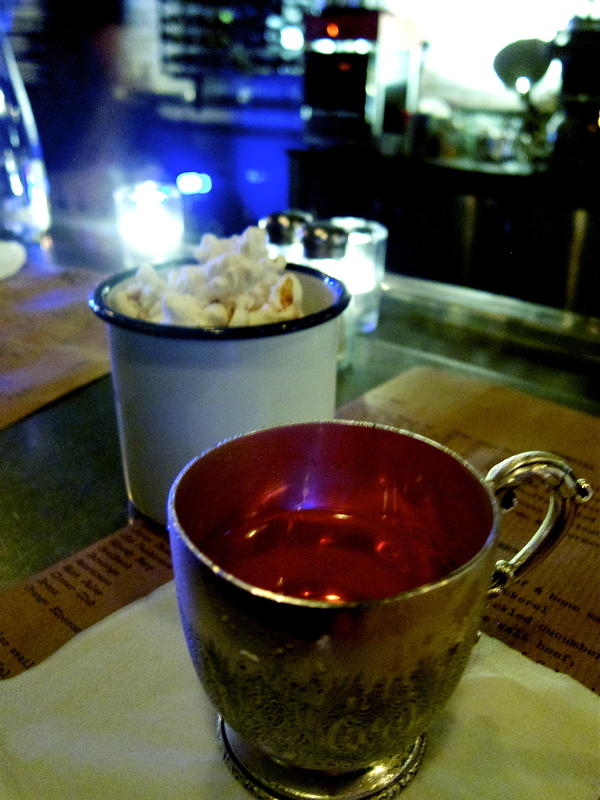 They have concocted some great cocktails and the food is simple, satisfying & just that little bit different for London. It is a great place to drop by for a drink and/or a quick bite, but you could easily find yourself there many hours later, even if you came alone. I was in London. I was working. It was late. I was alone. I needed food. I wanted comfort. Soho’s Rupert Street has traditionally offered a certain brand of ‘comfort’, although I wasn’t in the market for that. Luckily, the same street now offers culinary contentment too, thanks to Russell Norman’s third addition to the neighborhood in less than two years. Continuing the Italian language conceit – his first two restaurants are called Polpo and Polpetto – Spuntino is really not very Italian at all, aside from the name and presumably the kitchen’s pedigree. Russell described it to me as a “diner,” although this is diametrically opposed to those shiny aluminum-clad monstrosities that cater to the elderly by day and drunk college students by night, and have at least 30 pages in their menus. 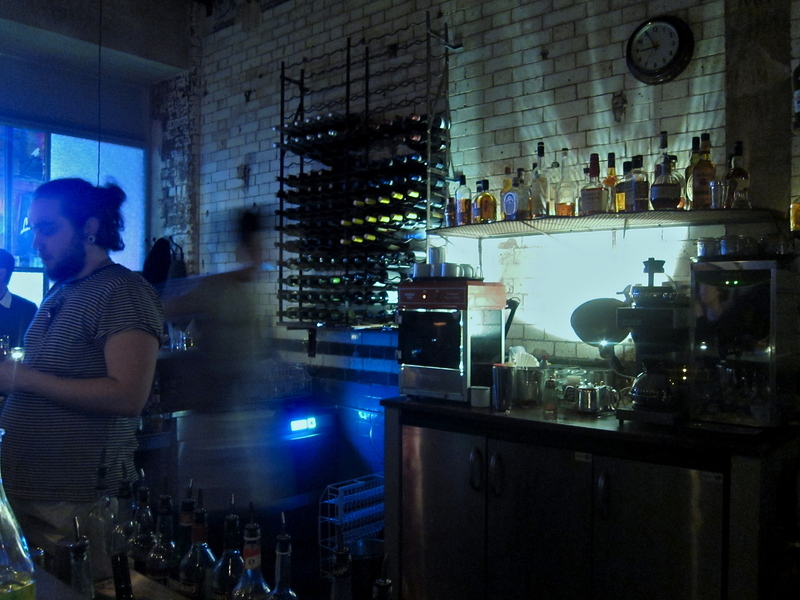 No, Spuntino is achingly hip; lower east side (LES) Manhattan hip. It is self-conscious of this fact, yet not in an annoying or condescending way, which is not very LES. Despite the efforts of its raised ceiling, Spuntino is a very small space, and easily gets cramped in the evenings. Ajax, the imposing yet soft-spoken restaurant manager who used to run the bar at sibling Polpo and is the progenitor of the creative speakeasy-inspired cocktail menu, informed me that since they opened the doors, it has pretty much been busy the whole day through (they open at 11am and close ‘late’), every day. On my visit, they had been open for about three weeks and he hadn’t had a day off yet. Spuntino is essentially one large u-shaped bar, which has a beautiful nickel-like metallic finish. There are 24 stools and a long makeshift corridor along the long side of the ‘u’ that leads to a small backroom, which has a table that seats six. When they took over the space from a non-noteworthy Indian restaurant, they discovered original tiles buried deep beneath the plaster. These, as well as the extra feet of space they uncovered above the previous ceiling, add considerably to the charm of the room, as do other countless little design details such as the choice of hanging lights. 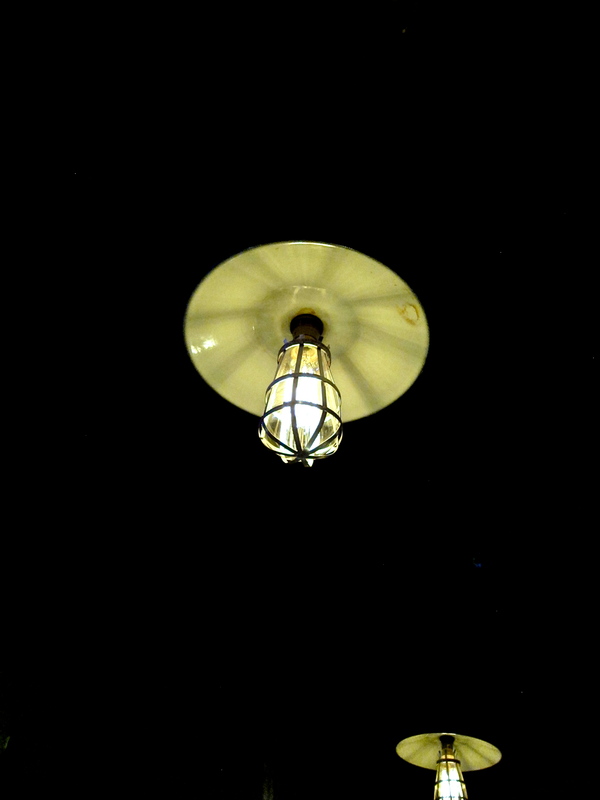 At night, the place is dark, the music is a slightly loud and infatuating collection of mainly American classics, and it is populated by the type of people who tend to know about cool things before others do (present company generally excluded). The staff all seemed to be tattooed somewhere or other, and almost in spite of their appearances also tended to be very professional, especially given that their computer system had broken down on the night of my visit and all the tickets had to be done by hand. As I was dining solo, and as the bar has an even number of stools, I was seated straight away despite the hulking mass of onlookers who were sipping cocktails and waiting for a spot to sit. Score. As with Polpo and Polpetto, the menus are printed on a stylish thick rectangular piece of paper that serves as your place-mat for the evening. The food is somewhat of a mish-mash of things (sort of like a diner, I guess), but everything sounds appetizing and much of it seems downright naughty if you have any airs about being at all healthy. But this was fine. Given the day I had just had, and the week I was about to, I felt the need, the need for greed. Before consuming any food, I decided I should try one of their cocktails, which all sounded interesting. My initial tipple was the Sazerac, which was poured from a silver teapot into a beautifully engraved antique silver teacup – cutely in-keeping with the prohibition-era theme. There was no getting around it, the drink was d*mn strong. In addition to the main ingredients (Sazerac rye whiskey, Peuchaud’s Bitters, lemon peel and definitely some kind of sweetener), it apparently contained a splash of Absinthe as well, so I knew this was going to be a walk on the wild side. Though it was strong, it was deftly balanced, and I enjoyed sipping on it – as I would a cup of tea – while perusing the familiar-looking menu that was full of unfamiliar dishes. After ordering, they brought me a mug of complimentary popcorn fresh from the little machine they have behind the bar. It seemed sort of incongruous, but the Absinthe was kicking in, so I really didn’t mind. 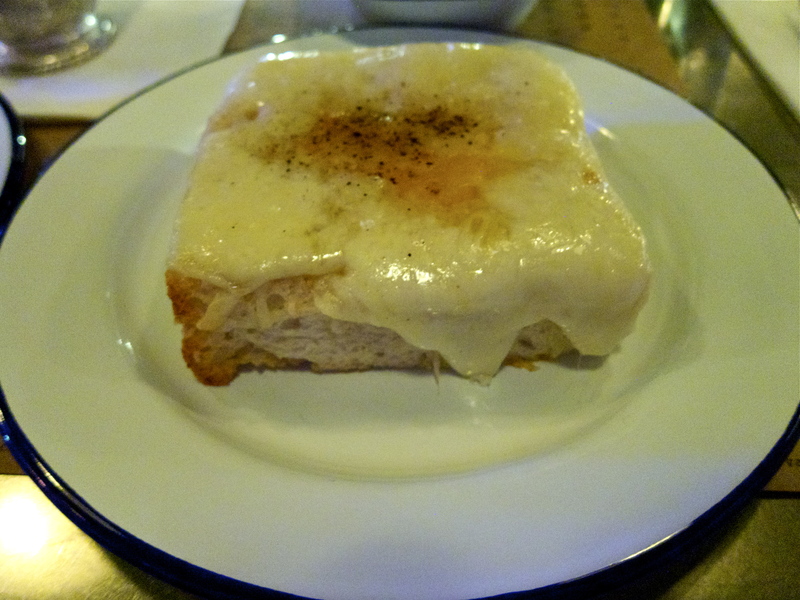 First up was a dish that perfectly illustrated Spuntino’s schizophrenic identity. 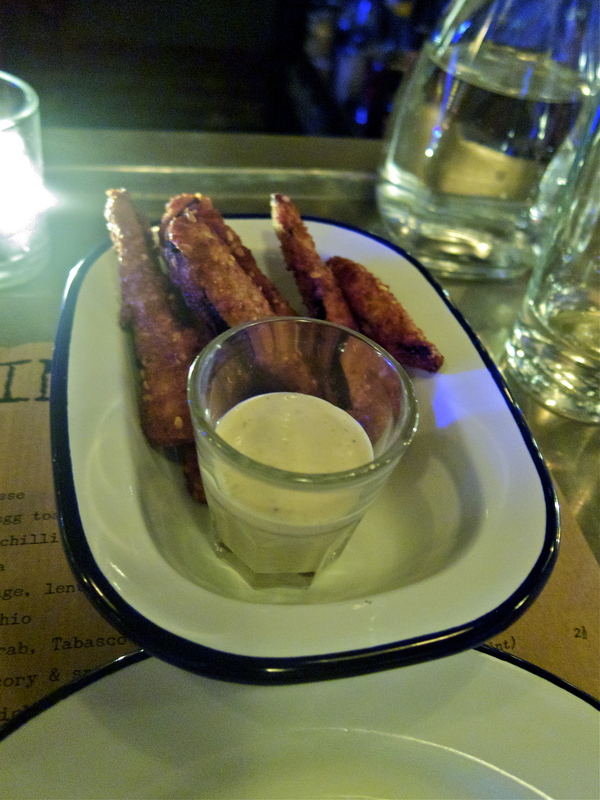 ‘Eggplant’ (American for aubergine) ‘Chips’ (British for fries) and ‘Yoghurt’ spelled the British way. Despite the cross-cultural spelling, my verdict on the dish couldn’t be clearer: it was great. Perfectly light and crispy, the richness of the chips’ breading and the eggplant itself was balanced by the cool, creamy ‘yogurt’ (I am American so spell that way, except for the occasional unintentional intrusion from Microsoft Word’s spell-checker, which is for some reason permanently set in UK English on my computer). Simple and delicious; ‘nuff said. I also enjoyed my little slider. Essentially a ground beef meatball, they are apparently cooked in butter and, after they have reached the desired level of done-ness, they mop up the juices in the pan with the soft and slightly sweet miniature buns. 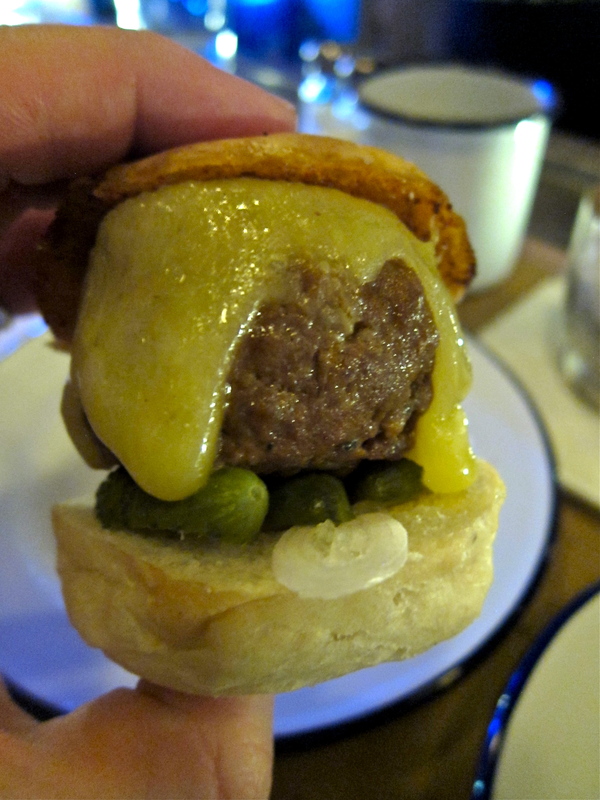 The beef itself was a nice consistency, and combined with the remnants of butter and marrowbone, this was a great little bite (or two), with some tang from the pickles steering it away from being too rich and providing some welcome crunch. Nothing life changing, but very satisfying indeed. I had read rave reviews of the simple-looking truffled egg toast. From what I could make out, this was basically a thick slice of decent crusty white bread that had been hollowed out in the center to make way for oozy orange egg yolk, on top of which had been added a generous layer of cheese (which was either all or part Fontina) and a healthy dash of truffle oil. There was a very pleasant and distinct resonance from the truffle oil, and the textures all worked. It was nice, but not quite as good as I had expected given the comments I had seen. Maybe I shouldn’t have expected the world though…after all, it is white bread, cheese and eggs. As I was taking a breather, and pondering what to order next, Ajax decided to make me a follow-up cocktail on the house. This was after I had ordered and began drinking a glass of Polpo’s own-label prosecco, which is supplied by Dal Bello from Treviso, and is particularly nice, with the slightest sweetness to it. The cocktail was also very good, although all I can remember about it now was that it was orange in color and sort of sweet and sour. Like my first drink, it was more balanced than I was becoming. I wasn’t quite sure what to order next, but felt that I needed some enzymes to dismantle the deviousness of my first trio of dishes. Ajax strongly recommended the ‘duck ham’ salad. They make their own ‘ham’ by aging the duck for 10 days in the Polpo kitchen. This might have been my favorite dish. It was a really great salad, with a zippy dressing, and the duck itself was divine. 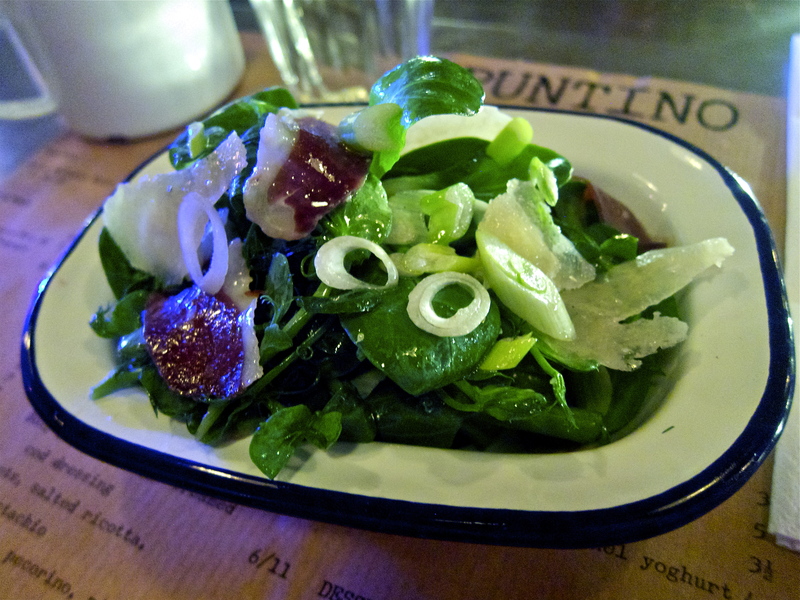 The pecorino gave it that little bit of salty and nutty richness while the mint kept things fresh. Once again, simple but excellent. 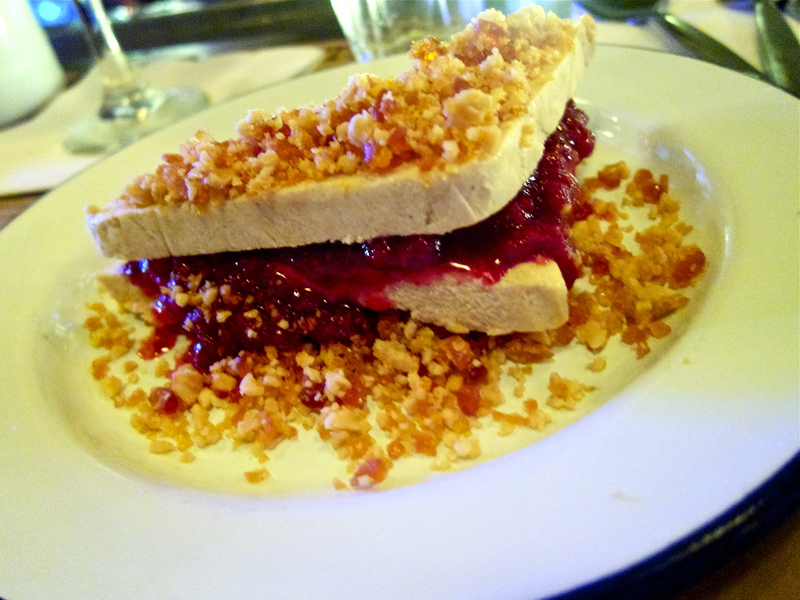 For dessert, it had to be a peanut butter and jelly ‘sandwich’. The trick here was that the bread of the sandwich was in fact peanut butter ice cream. This was downright delicious, and the size wasn’t too small either. The berry sauce was rich and the heap of crunchy peanuts and toffee made for the perfect topping. I enjoyed every bite. And with this, I offered my sweet surrender. 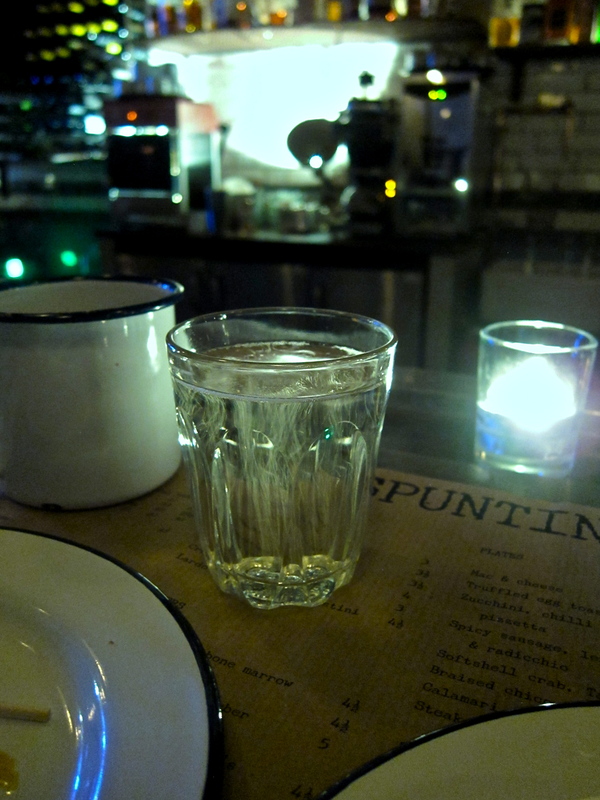 While I have enjoyed meals at both Polpo and Polpetto, Spuntino is definitely a bit of a departure. While the décor is roughly of the same ilk – perhaps a bit broodier – and the food is arranged in small plates, it is definitely not Venetian (or for that matter Italian). It is comfort food, up with a twist. This makes it fun, especially when the cocktails are as good as they are. Beyond the gratifying food and innovative libations, Spuntino is a vibe, an atmosphere. It is just a really fun place and you can’t help but be in a good mood once you step in from the colorful amusements on the other side of the frosted glass. If I still lived in London, I could see myself coming here a bit too often. This entry was posted in Casual Fare, Laissez Eats and tagged Bars, Diner, London, Lower East Side, Polpetto, Polpo, Restaurants, Rupert Street, Russell Norman, Soho by laissezfare. Bookmark the permalink. Thanks for your comment – I will definitely do so next time I make it back there. Are you still in London LF? Good to see you managed to fit in a Spuntino trip anyway. I agree it is more a bar than a restuarant – but good fun!